More than 3 million Kenyans in four counties are set to start enjoying universal health coverage after President Uhuru Kenyatta launches a pilot programme on December 1. President Kenyatta announced that the programme will be launched in Isiolo, Kisumu, Nyeri and Machakos counties. The launch will coincide with the World Aids Day, whose theme for this year is "Know Yourself". The pilot phase is expected to last for a year before it is scaled up to cover the rest of the country. After registration, patients will be treated free of charge, including referrals. 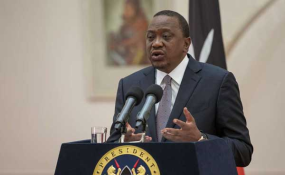 President Kenyatta formally made the decision on Tuesday after meeting the UHC Inter-Governmental Committee that also comprises governors at State House, Nairobi. Health Cabinet Secretary Sicily Kariuki, who co-chairs the committee with Isiolo Governor Mohammed Kuti, briefed the President on the preparations ahead of the pilot launch. Ms Kariuki said the pilot programme will cost the government around Sh3.17 billion. The national government will allocate Sh800 million for each of the participating counties, with an additional 800 million for referral cases. Governors will also contribute a similar amount towards the programme. The success of the pilot programme in the four counties will clear the way for the national rollout, which will mark the beginning of a new era in public health service provision. Governors Mutahi Kahiga (Nyeri), Prof Anyang Nyong'o (Kisumu) and Dr Alfred Mutua (Machakos) represented the counties taking part in the pilot. President Kenyatta gave the committee his approval to finalise the launch plans and also draft the respective Memoranda of Understanding between the Ministry of Health and the four counties. The Head of State encouraged the governors to actively sensitisate their people before the pilot project is launched. The new UHC package will benefit at least 3.2 million Kenyans in the four pilot counties and is expected to contain a new bouquet of services accessible in public health facilities. According to the government, the decision to pilot the programme in the four counties was based on existing evidence on their disease burdens. Kisumu was identified because it leads in the infectious diseases category, especially for HIV/AIDS and tuberculosis, while Machakos records the highest number of injuries mostly from accidents occurring along the busy Mombasa-Nairobi highway. Nyeri was selected because it leads in non-communicable diseases, especially diabetes, while in Isiolo, the government will seek to establish how the package is well suited for nomadic and migratory populations. Isiolo Governor and Council of Governors' Health Commitee chair Mohammed Kuti said the pilot will be done for a year, and its progress reviewed after six months. Prof Nyong'o said community health volunteers will be paid a monthly stipend of Sh2,500 plus National Hospital Insurance Fund membership as part of efforts to recognise their work. "Community Health Volunteers were previously known as volunteers, but now we will eliminate that word from the health sector's vocabularies. We will be paying them Sh2,500 a month in addition to securing their NHIF membership. This is not a salary since the work they do is much more valuable than that, but a stipend to initiate our efforts to bring them into the ranks of the remunerated," said Prof Nyongo. Dr Mutua said expenditure on health is a major contributor to poverty. "Many families are falling into poverty because they are spending their savings on health-care services. But under the new scheme, our people will not be paying for health services," said the governor. He said if the funds lost to corruption were used for health service delivery, every Kenyan would be comfortably covered in the UHC scheme. "Piloting the package in a controlled population ensures less chances of failure and we can minimise the risks when the programme is later scaled up to cover the entire country," said CS Kariuki in an earlier statement. Ms Kariuki said the programme would also encompass public health education in order to scale up preventive measures and reduce the prevalence of non-communicable or lifestyle diseases. "We have reorganised the community health workers' service delivery systems to address issues of water, sanitation and health, nutrition, screening for diseases, physical health education and dietary discipliner so that our people can be empowered to make the right lifestyle decisions and avoid falling sick unnecessarily," she said.